We are happy to announce that more than six million pages from British newspapers, including original images, have been added to our extensive historical records collection. The British newspapers include local and regional titles from England, Scotland and Wales from 1700 to 1950 and encompass nearly 200 titles. The British newspapers are part of an exclusive partnership with the British Library to digitise 40 million pages over the next 10 years. These fascinating newspapers contain a huge variety of stories about Australia and New Zealand. 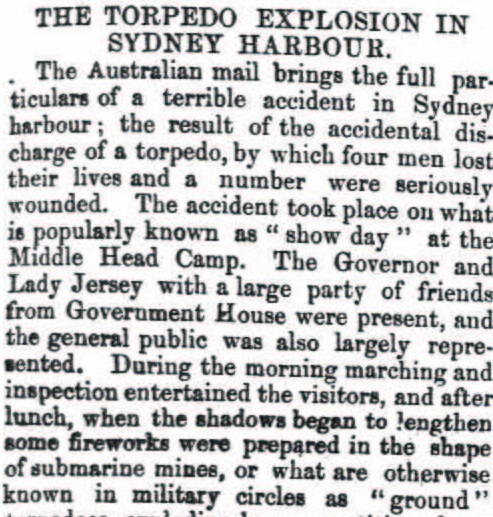 One article from The Star in 1891, explains the tragedy when four men died following the accidental discharge of a torpedo exploding in Sydney Harbour in 1891. This tragic case occurred when a fireworks show went horribly wrong on ‘show day’ in front of The Governor and Lady Jersey, a large party from Government House and the general public. Another major story reported in numerous British newspapers in 1835 was the narrow escape of Mrs. Guard and her children from cannibals in New Zealand. The detailed stories tell of a harrowing escape when the family was captured, stripped and dragged to nearby huts. Having been interrupted, the party escape being eaten by natives and lived to tell their story.